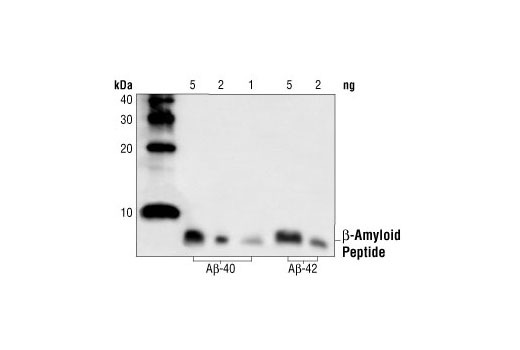 Western blot analysis of human A-beta-40 and A-beta-42 peptides (1-5 ng), using beta-Amyloid Antibody. beta-Amyloid Antibody detects several isoforms of beta-amyloid peptide (Abeta), such as Abeta-40, Abeta-42 etc, regardless of phosphorylation state. Polyclonal antibodies are produced by immunizing animals with a synthetic peptide corresponding to residues at the amino terminus of human beta-amyloid peptides. Antibodies are purified by protein A and peptide affinity chromatography.